Underway from January 15 in Prayagraj, Kumbh Mela is expected to generate a revenue of Rs 1.2 lakh crore for Uttar Pradesh, says a Confederation of Indian Industry (CII) report. 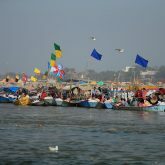 Although the Kumbh Mela is spiritual and religious in nature, the economic activities associated with it generate employment for over six lakh workers across various sectors, CII said. The Uttar Pradesh government has allocated Rs 4,200 crore for the 50-day Kumbh Mela this time, thrice the budget of the Maha Kumbh in 2013. The hospitality sector aims at employing 2,50,000 people, airlines and airports around 1,50,000 and tour operators around 45,000. The employment numbers in eco-tourism and medical tourism are being estimated at 85,000, says a CII study. Apart from this, there will be around 55,000 new jobs in the unorganised sector comprising tour guides, taxi drivers, interpreters, volunteers, etc. This will lead to increase in income levels for government agencies and individual traders.